Style is learned, adopted, manipulated, and developed over time. Sometimes on accident, sometimes on purpose, and often times both. Your style is a combination of your voice, techniques, color choices, compositions, subject matter, media, and more all wrapped up. Your style is what binds each of your pieces together into a unique and cohesive collection. The best part is that it continues to evolve over time. Even when you’ve found it, it starts to change. Are there elements of design that tie your pieces together? What themes show up in your art most often? What kind of subjects are you drawn to? Many or a few? What kind of art do you enjoy creating at the moment? Does your art stand out against the work of other artists? I can always tell when someone is still in the exploratory phase of their art. When an artist jumps around between many subjects, or when their pieces are lined up together and appear as if a they all could come from different artists–they haven’t quite figured out their style yet. There’s absolutely nothing wrong with this! It takes time and a lot of work. So, if you are currently looking for your style, I’ve created a worksheet to help you brainstorm and collect your thoughts as you read this post. How do artists find their style? First, no artist or creator is completely original. Inspiration for our styles comes from the world around us and what we choose to expose ourselves to. It doesn’t develop out of thin air. The simple formula for finding your style is to take in stimuli from the outside world and twist and shape it into something new with your mind and your hands. Repeat this over and over in a variety of ways. If you are stuck, you need to find new stimuli. But a bunch of them. If you copy one exactly, you are ripping them off. If you take partial ideas from multiple artists, then you are able to make something unique. If you haven’t already, you need to read “Steal Like an Artist” by Austin Kleon. It’s full of helpful creative advice. If you are drawn to a certain artist’s work, it’s probably stimulating part of your style. When I first started drawing as a teen, I was obsessed with the art of Brandon Boyd. To this day, I have to credit him for my obsession with line work. In college, I fell in love with Alphonse Mucha and Art Nouveau. More recently, when I got into fluid painting, I was naturally inspired by Emma Lindstrom. You can see their influences in my work, but you can also see that my style does not look exactly like theirs. Take little style elements from any source you can. The more, the merrier. Mimic nature. Study light, form, color, and shape. Take figure drawing classes. Set up a still life in your living room. Working on your technical skills regularly will introduce you to new perspectives and style paths. If you are only doing art in your head (chronic procrastinators know what I’m talking about! ), your style won’t develop. If you only do art a couple of times a month or less, you won’t see much progress. Try to create as often as you can. Every day is best, but a few times a week is perfect. Push your skills. Draw with your non-dominant hand. Study a variety of subject matter. Work big. Work small. Explore loose and fast sketching. Practice tight and slow sketching. If you don’t know what you like doing yet, then practice as many skills as you can. 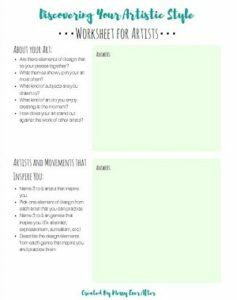 If you plan on or have already taken college art classes, you learn that instructors assign exercises in as many styles as they can fit into a semester. They assume you have no idea who you are as an artist, so they push you in every direction to help you develop your unique voice. Release expectations and just have fun. When you have a precise vision for what you want to create, you limit your perspective and create a blind spot. I’ve set out to create one thing, ‘screwed it up’ and created something entirely different that I loved and now incorporate into my style. If I would have stuck to my expectations, I would have considered this a failure. Surprising things can happen when we become more playful and just let art happen. Finding your style often involves knowing who you are as a person and embracing it. It sounds cheesy, but being an artist isn’t just a career or hobby, it’s a lifestyle. The more you weave art into your daily life and your personality into your art, the easier it will be to cultivate your style, but all of this takes time. Creating and showcasing your personal style is a wonderful achievement. Some artists develop early, and some take years to find their rhythm and voice. Whatever pace you need to work at is the right pace. Honestly, I’m still working on mine. Don’t try to force your style, but exercise your art muscles whenever you can. I hope this post was helpful. If you have any questions, leave them below. And if you need an outside perspective and help finding your style, I’m always happy to offer my coaching services. Thank you for writing and sharing this article. I have been struggling to find my artistic style but you have given some great tips that I think will help me to get where I want to be as an artist. I love following you and reading your blogs as well as seeing your work. It is truly AMAZING!